Technically, today is the second day of Christmas during the 12 Days of Christmas . . .
that extend through January 6th, the “Feast of the Epiphany” that recognizes the journey of the Three Wise Men following a star to find the baby Jesus. We ladle this comfort food over hot polenta smothered with melting cheese . . . my mother uses Brick cheese, but I prefer layering on Fontina. If you have a big soup tureen, fill it up to the top and bring the stew to the table for everyone to dip in for second and third servings! 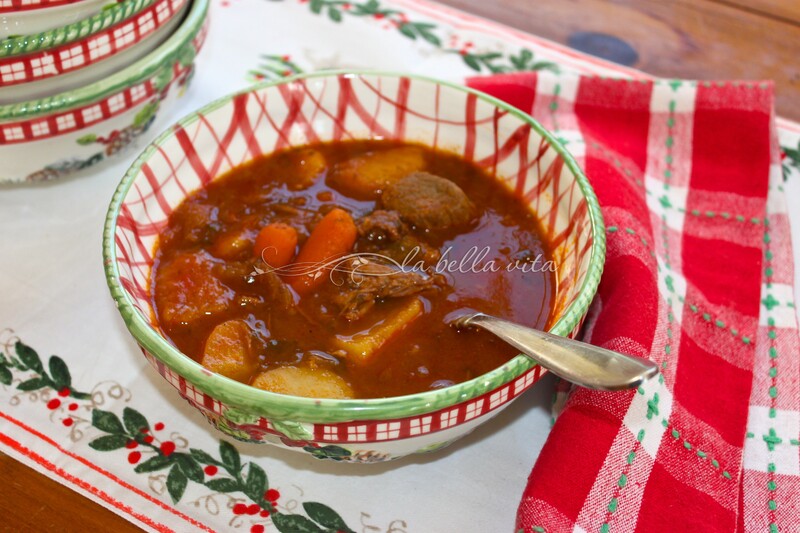 You can also enjoy this beef stew without any polenta! 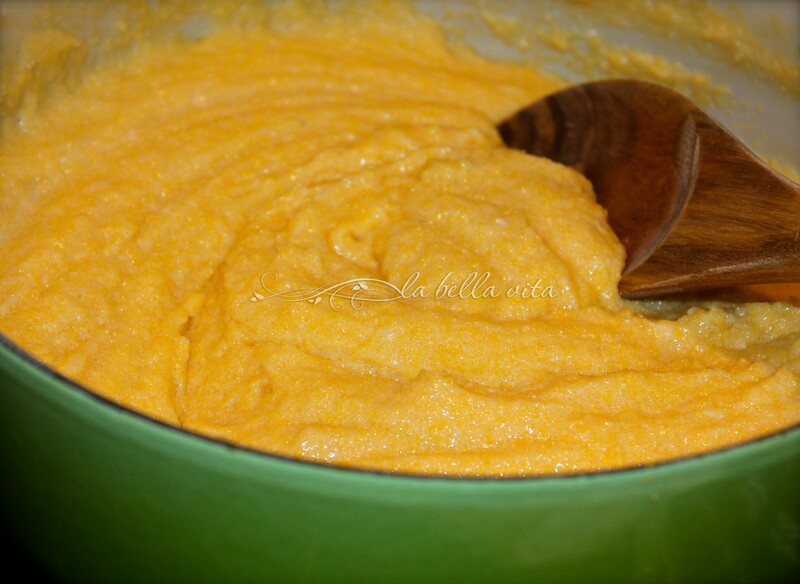 Making polenta is not difficult, it just takes a little elbow grease to stir while it thickens up . . . don’t let it intimidate you! 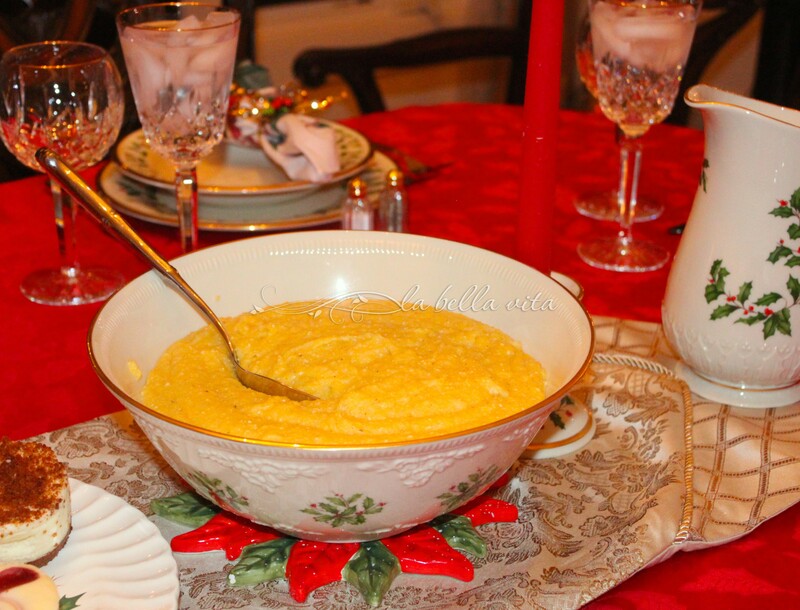 find a pretty decorative bowl to pour in the hot, cooked polenta for a wonderful festive presentation! ABOVE: pass slices of soft cheese, such as Fontina, so that it melts once it touches the hot polenta and when the hot stew is poured on top! Pour any left-over polenta into a large bread loaf, refrigerate, and cut into slices for the next morning to fry. Serve with cheese or maple syrup! I hope that you enjoy this Italian Beef Stew on Fontina Polenta! This stew looks absolutely delicious. I adore polenta, and would be thrilled to have three bowlfuls of this. 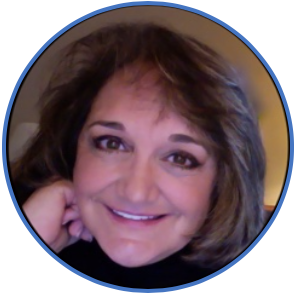 Enjoy your holiday season, Roz! Thank you so much Debby! I hope that your Christmas was merry and that your new 2015 will be awesome! This is for sure my kind of warming and comforting food. Continue to enjoy your holidays, Roz! Looks like a perfect Christmas Eve meal. I love polenta especially fried for breakfast. Oh my gosh, that fontina melted on the polenta!! 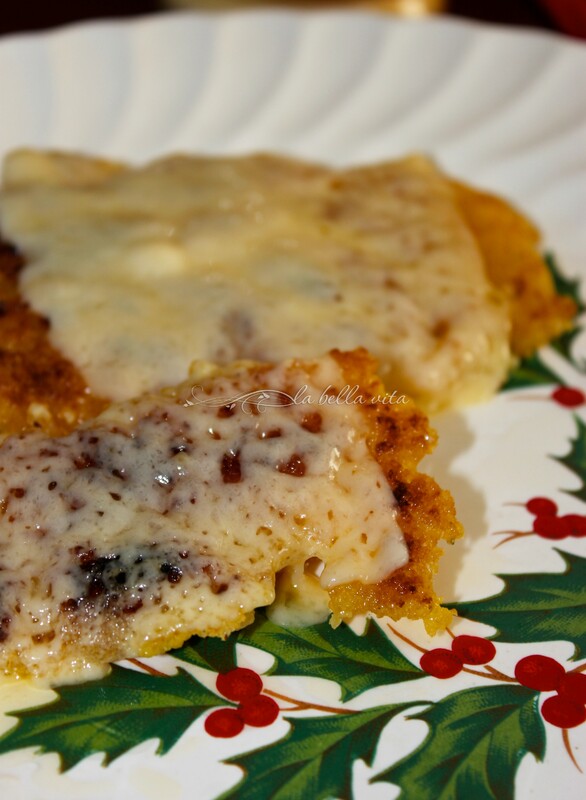 I adore polenta and the idea of melting Fontina–well, that is just icing on the cake. Serving this with stew is a wonderful idea. 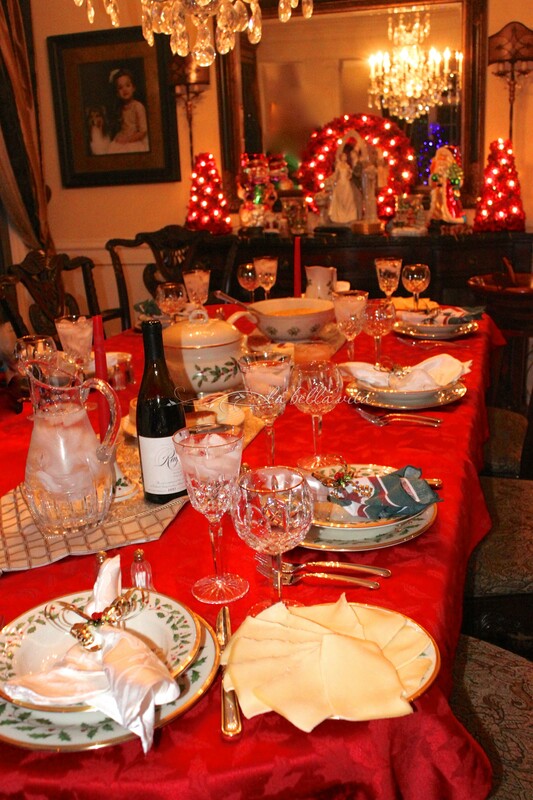 Your holiday table was beautiful. Buon Natale. What a gorgeous table! That stew would taste so good right now too. Happy New Year, Roz! What a luscious comfort meal! This is perfect for those chilly January nights ahead. That looks like such a yummy dinner for Christmas Eve. Everything about it is so comforting. I absolutely love your table setting and dishes, too. Pinning both recipes to try soon – after I’m done with my diet! :( Thanks for sharing your beautiful traditions, Roz! Keeping this recipe in my folder looks so delicious. 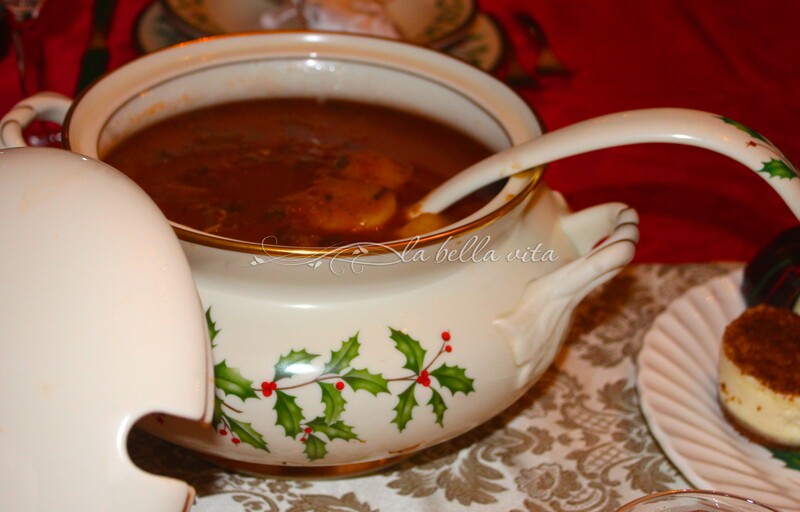 This stew is our traditional Christmas Eve dinner; it never disappoints and I hope that you enjoy it! 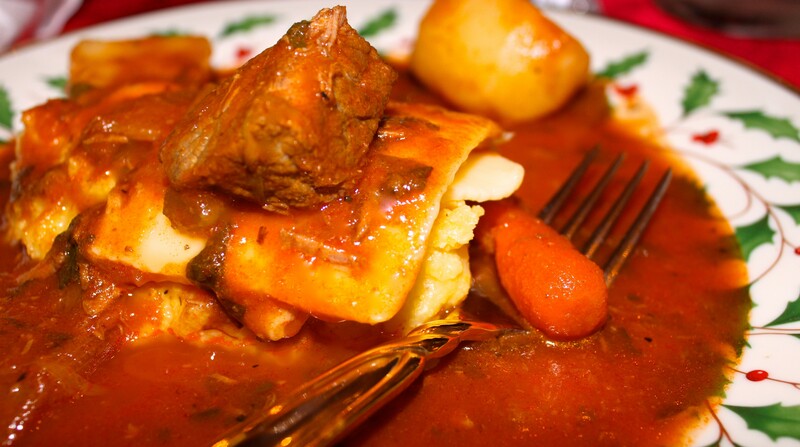 The cheesy polenta melting underneath the hot stew is unforgettable!